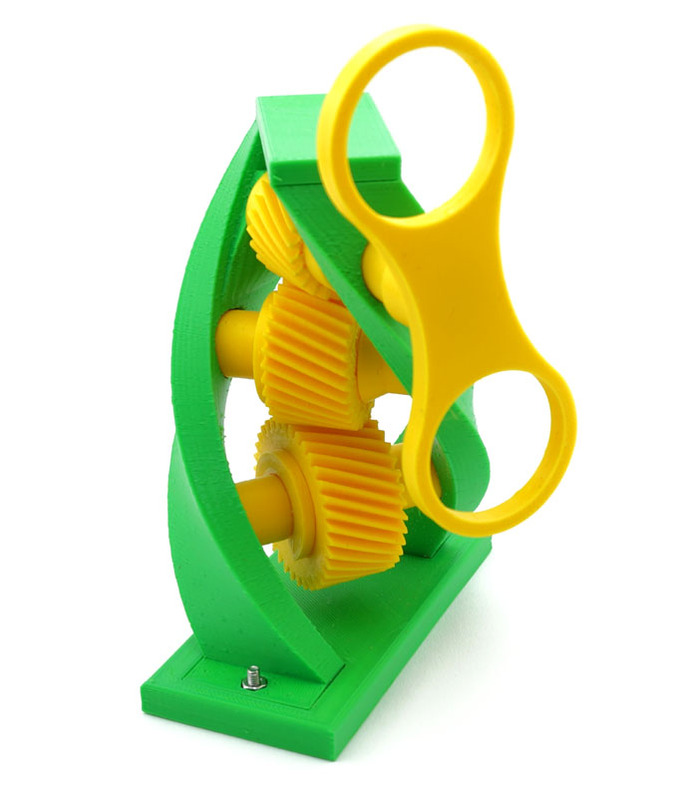 Our collection of 3D-printable gear mechanisms would be incomplete without the model of a screw gear drive. Screw gears are regular helical gears mounted on non-parallel, non-intersecting shafts. They are also known as crossed helical gears. The shape of this screw gear drive was inspired by the DNA molecule. In this particular model, there are three gears mounted at 45° to each other, but the shaft angle can be any number between 0 and 90°. Our screw gear calculator allows you to model the outlines of two meshing screw gears in Blender instantly. 1 sg_base.stl The base of the model to which the stand is attached. 1 sg_stand.stl The two-spiral stand to which the gears are attached. 1 sg_bottom_gear.stl Bottom 36-tooth gear. 1 sg_middle_gear.stl Middle 30-tooth gear. 1 sg_top_gear.stl Top 24-tooth gear. 2 sg_lower_axis.stl The axis on which the bottom and middle gears are mounted. 2 sg_washer.stl The washer that secures the bottom and middle gear on their axes. 1 sg_upper_axis.stl The axis on which the top gear, stop tube and spinner are mounted. 1 sg_stoptube.stl The stop tube mounted on the upper axis next to the top gear. 1 sg_spinner.stl The finger spinner which sets the model in motion. 1 sg_bridge.stl The bridge connecting the two spirals of the stand for security. Mount bottom gear onto lower axis. Secure with washer. Mount middle gear onto the 2nd lower axis. Secure with washer. Insert the ends of the lower axes into the bottom and middle holes of stand. Mount stand onto base, secure with two screws and nuts. Insert the narrow end of upper axis into the top hole of one of the spirals from the outside, then into stop tube, top gear, and the other spiral's top hole. The top gear's narrow end must point away from the stop tube. Align the holes in the stop tube and top gear with the holes in the upper axis. Secure with two scres. Attach spinner to the upper axis, align holes, secure with a screw.